What a huge Water Tanker (WRT).Quite useful in code 5 fire.Renault Kerax is usually used by military. Added by Bomba Boy on 24 December 2006. 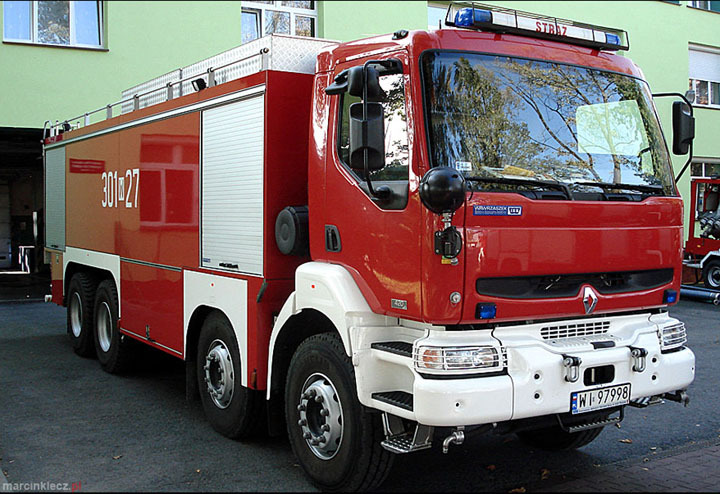 Warsaw have 2 of this truck... but also have 4 Tatra's 815 build by Karosa and 2 Steyr's bulid by Rosenbauer and Warsaw 17 th (Fighting seventeen :)) have only in Warsaw cistern with 28000 liters of water or foam and pomp 13000 l/min on Renault Magnum bulid by ISS Wawrzaszek. Added by Marcin on 24 December 2006. Can you tell me the locations of the fire stations in Krakow please ? I visited there in October and only managed to find one station in the city centre (westerplatte). I`m going back in August and would like to visit some more. Added by Andy Daley on 05 January 2007. Added by Marcin on 06 January 2007. Added by Harakat on 12 February 2010.